What do you think is the biggest threat to an urban environment now and then? Yes, it is fire! Many ancient and modern cities fell victim to its disruptive forces. Luckily, there are fire fighters always on standby and ready to help. How important they are could be seen in downtown Buenos Aires today when two fire incidents were reported, one in a restaurant in Montserrat and another on Avenida Madero where a truck caught fire. Fortunately, in both cases, no persons were harmed. 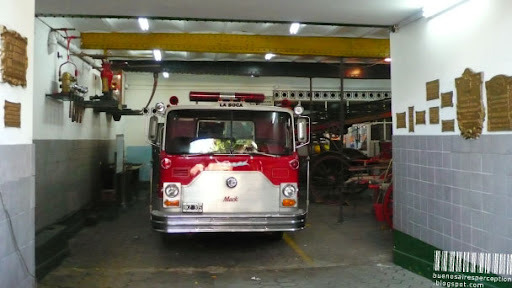 The fire truck in the picture, a Mack CF 650 from 1973, belongs to the fire brigade of La Boca. You will find the fire department in Avenida Brandson 567. Fire fighters deserve a LOT of credit for the work they do. I'm terrified of fires. When in the Navy, they drilled in us that fear and the need for great care around anything combustible. Older cities today are especially vulnerable so a good fire department is often salvatory. I agree with EG Tour Guide. Our firefighters are our first line of defense. It is an extremely difficult job and many die every year in the line of duty. Sometimes I'm afraid we do not appreciate them as much as we should. Both the metropolitan firies and the bush fire brigade. I know in 2006 when my son's house burnt down and he lost everything (except his dog) how that became obvious. Nice station. Nice to know that someone's on the job. You're lucky to have this firetruck ready for battle. There was one incident here when a 100-yr old church got burned down because the city had no equipment. That was probably one of the saddest ways of erasing history. Indigenous Protests in Chaco – Because of Food!